The company confirms hybrid systems are a growing focus area. Siemens Gamesa, the leading turbine manufacturer, is looking to go beyond wind — into hybrid systems with solar and storage. The company’s chief technology officer, Antonio de la Torre Quiralte, told GTM that Siemens Gamesa remains committed to the wind market. However, it is increasingly interested in other technologies to reduce renewable energy intermittency. “Following the merger about one year ago, we realized that our two former companies were quite interested in resolving the renewable problem, which is discontinuity,” he said. The development of systems that can provide baseload or near-baseload capacity could involve the hybridization of potentially complementary generation technologies such as wind and solar. But storage is a big part of the equation. “It definitely is in our roadmap,” de la Torre said. De la Torre said the manufacturer is focused on solutions rather than products, integrating energy storage with renewable plants at the project level. He also said Siemens Gamesa is looking beyond today’s existing utility-scale battery storage capacities, which typically run to tens of megawatt hours, to gigawatt-hour levels of storage. Batteries will remain the company’s technology of choice for standalone hybrid and off-grid systems, which demand storage capacities of between 500 kilowatt-hours and 50 megawatt-hours for onshore wind and PV plant balancing. But Siemens Gamesa is also investigating a thermal storage system called the Future Energy Solution, which could boast much higher capacities. A demonstration plant currently under construction in Hamburg will be able to deliver 1.5 megawatts of power for 24 hours. Recently, for example, Siemens Gamesa started testing a 120-kilowatt, 400-kilowatt-hour redox flow battery at its La Plana test center near Zaragoza in Spain. The test center had previously been used by Gamesa to put together a hybrid system combining traditional gensets with wind, solar and storage in 2016. Customer interest in hybrid systems with storage has grown in the last six to nine months, de la Torre said. One example is the Bulgana Green Power Hub project owned by Neoen in Australia, where Siemens Gamesa will be acting as an engineering, procurement and construction contractor, and will be integrating a 194-megawatt wind farm with 34 megawatt-hours of Tesla storage. 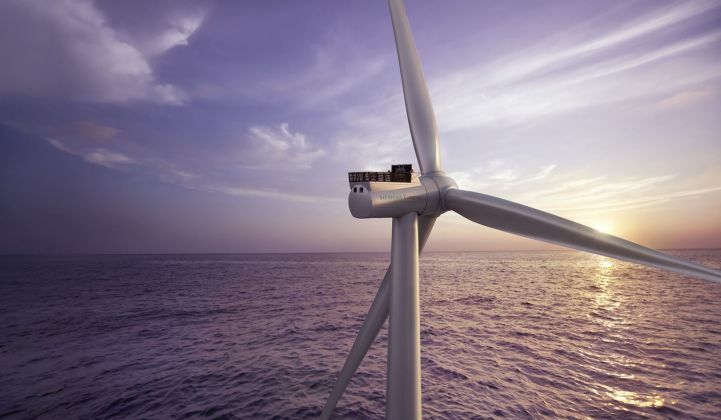 Hong Zhang Durandal, a business analyst with MAKE Consulting, said Siemens Gamesa’s growing interest in hybrid systems reflects a wider trend within the wind industry. OEMs are not interested in having storage as a product, he said, but see value in adding other technologies to wind farms, for example to help avoid curtailment or smooth out imbalances. In a recent question-and-answer session published by Wood Mackenzie, Durandal said wind-plus-storage could offer new opportunities for energy production in the U.S.
“Wind farms paired with energy storage can shift energy from periods of low prices to take advantage of spikes and shift energy in bulk when it is most needed,” he said. Pairing wind with energy storage also helps with ramp-rate control, can avoid curtailment and could open the door for project owners to compete for ancillary services revenues.